Support for Unintended Pregnancy: Remember to A.C.T. Affirm the client for making a choice that they feel is best for them at this time. Use client-centered, affirming language (e.g., “planning an adoption” NOT “giving up your baby for adoption” and “birth mother” and “adoptive mother” NOT “real mother”). Discuss the three types of adoption (open, closed, familial). Based upon the client’s wishes, explore community resources (agencies that fit your client’s needs). Connect the client with legal help for reviewing documents and contracts (Legal Aid, Bar Association Pro Bono list). Invite the client to follow up as needed for support and resources. Request permission to follow up with them to ensure that they were able to access the services/resources they need. Discuss birth options (natural childbirth, epidural, hospital birth, midwife). Advocate with a provider’s office to connect the client with a provider who meets the client’s needs. Connect the client with financial resources (presumptive eligibility for Medicaid, WIC, SNAP). Connect the client with community support (new mothers groups, lactation support, trauma and healing support groups). Assess for mental health and substance use concerns and connect the client to treatment/supportive services. Provide the client with information on postpartum depression and anxiety prevalence, and normalize how frequently these feelings occur. Invite the client to follow up as needed for support and resources. Request permission to follow up with them to ensure that they were able to access the services/resources they needed. Mirror client language (if client says “end the pregnancy” vs. “abortion”, or “fetus” instead of “baby”). If needed, refer the client for a pregnancy test at a health department or a community health center to determine approximation of weeks. If the client has questions about the procedure, offer to call an abortion clinic with them. Connect the client with financial resources. Provide the client with information on abortion prevalence and normalize how frequently abortion occurs. 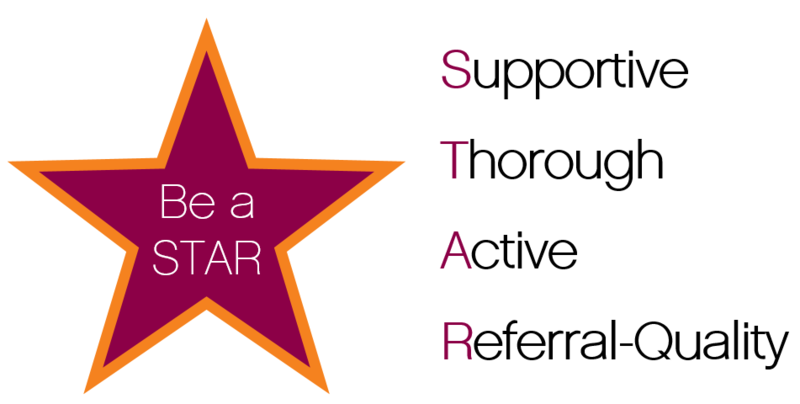 MAKE STAR REFERRALS FOR ALL SUPPORTIVE SERVICES! S Support the client’s decision; it is the best way to support them. T Thoroughly provide the client with all of the information and resources that are available to them. A Actively address barriers to accessing the services they need. Connect them with resources to provide access. R Follow up on Referral Quality to ensure that the client was able to access the services they needed and use their experience to improve services for the next client you serve.